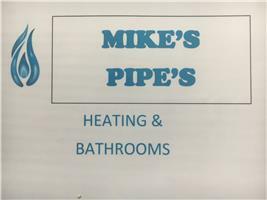 Mikes Pipes - Bathrooms, Plumber based in Marston Green, West Midlands. Hi my name is Mike Richards and I am a sole trader with 20 years experience as a Plumber/Heating Engineer. I have previously worked for British Gas as an Upgrades Engineer as well as teaching NVQ level 2 plumbing to aspiring plumbers for South and City College Birmingham. I pride myself on my last job and thoroughly enjoy what I do - from full central Heating systems - full Wetroom and Bathroom Design & Installations (including Tiling) - radiator changes - Boiler Changes - to tap washer changes.